Digital signal processing is commonplace in most electronics including MP3 players, HDTVs, and phones, just to name a few of the applications. The engineers creating these devices are in need of essential information at a moment's notice. 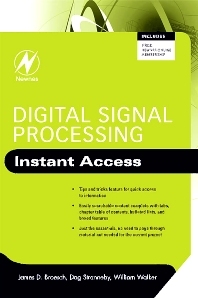 The Instant Access Series provides all the critical content that a signal or communications engineer needs in his or her daily work. This book provides an introduction to DSPs as well as succinct overviews of linear systems, digital filters, and digital compression. This book is filled with images, figures, tables, and easy to find tips and tricks for the engineer that needs material fast to complete projects to deadline.